Ever wondered if there’s a real-life storybook land out there with birds chirping, people singing, and cutesy little animals running around? (No, we’re not talking about The Sound of Music or the Enchanted Forest, but you’re close.) Let us introduce you to the charming medieval town of Rothenburg ob der Tauber in Germany. Sure, it’s not an actual Disney movie here, but you might just love it so much that you’ll start singing anyway. Here are 8 things you’ll want to know before visiting this hidden gem. 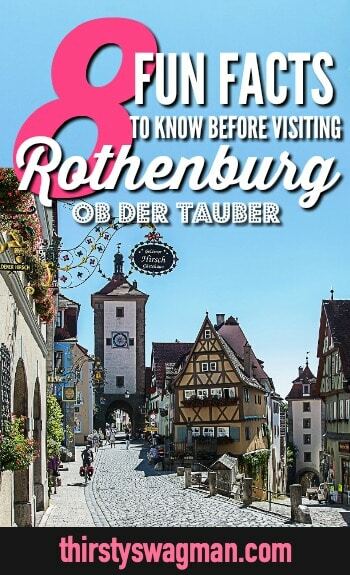 First things first: the place we’re talking about here is Rothenburg ob der Tauber. This is key, folks. There are other Rothenburgs in Germany, and if you’re not careful, you’ll wind up in the wrong one. (True story.) There’s a Rothenburg in Saxony, Germany, and another one in Switzerland… heck, there’s even Rothenburg an der Oder, which is the German name of Czerwieńsk in Poland. In German, the name “Rothenburg ob der Tauber” means “red fortress above the Tauber,” with the Tauber being the Tauber River. Rothenburg ob der Tauber is roughly 90 minutes southeast of Frankfurt and 2.5 hours from Munich by car. While the town is technically part of Bavaria, the region around the town is called “Franken,” or “Franconia” in English. The region strongly identifies itself as “Franken” and much less as Bavaria. 3. Rothenburg inspired the 1940 Disney animated film Pinocchio. 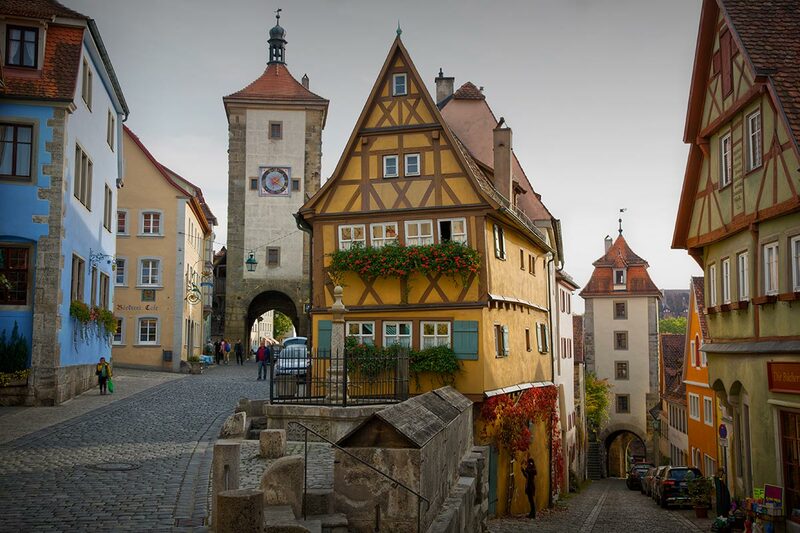 If there’s a reason Rothenburg feels like a Disney movie, that’s because it inspired one. (Perhaps when Walt Disney wished upon a star, he found Rothenburg?) In any event, the fairytale-like town of Rothenburg served as the inspiration for the animated Disney film Pinocchio, as well as the location of the Vulgarian village scenes in 1968’s Chitty Chitty Bang Bang. Fun fact: filming was also done in Rothenburg for Harry Potter and the Deathly Hallows — both Part 1 and Part 2! 4. Speaking of which: for that perfect Instagram photo of Rothenburg, head to Plönlein. This isn’t a postcard or a fairy tale — it’s real life. How gorgeous is this? 5. The mayor of Rothenburg once saved the town from imminent destruction by drinking a @#$!ing lot of wine. 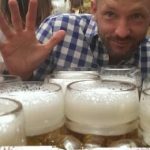 In what is perhaps the best legend ever about wine saving people’s lives, Rothenburg ob der Tauber was saved from a savage enemy through the drinking abilities of its mayor. In 1631 — the middle of the Thirty Years’ War — the Catholic army was poised to attack the Protestant town of Rothenburg. Apparently the custom at the time was for the mayor to give the conquering general a drink (what? WHAT?). After enjoying his wine, the general got too big for his britches and challenged the mayor to drink a 3.25-liter tankard of wine in one gulp (this is why it’s never a good idea to make bets while drunk). If he could, the town would be spared. Fortunately for Rothenburg, the mayor delivered (though probably wound up with a massive hangover)! 6. Take the Night Watchman’s Tour to learn more about tales of medieval Rothenburg. Not to be confused with the “Night’s Watch” of Game of Thrones fame, the Night Watchman’s Tour is a fabulous way to spend an evening in Rothenburg ob der Tauber. Known in real life as Hans Georg Baumgartner — though he looks like he could fit in with the cast of Monty Python — the Night Watchman will take you on a “walk back in time” through the town. At only 8 euro, it’s an inexpensive — and fun — way to get to know Rothenburg and its medieval past. 7. You’ve got to eat a Schneeball. You can’t visit Rothenburg ob der Tauber without trying a Schneeball, a German pastry that’s quite popular in this area. Schneeball, meaning “snowball” in English, derives its name from its ball-like shape. It’s traditionally decorated with white confectioners’ sugar (aka powdered sugar), but you’ll also find ones glazed with chocolate and nuts or perhaps with marzipan inside — new variations are emerging all the time! 8. It really can be Christmas all year round. Rothenburg ob der Tauber is home to a veritable Christmas Museum. Käthe Wohlfahrt, a German company that sells Christmas decorations, is headquartered in Rothenburg; its main shop features a Christmas Museum. Both the shop and museum are open all year, which means you can get your nutcrackers, ornaments, and candles whenever you want. Even if you don’t celebrate the holiday, it’s hard to deny how cheerful the shoppers are! Oh and most importantly: there’s a tavern called Zur Höll in town which is around 1,000 years old. That alone is worth the visit. 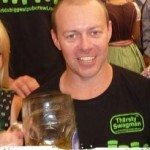 Excited to check out Rothenburg ob der Tauber and its thirsty roots? 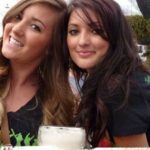 Check out our Beer or Bust tour packages now!